Minutes before Great Day Take Off. Going off to college can be kind of scary but creating a safe place to call home (temporarily) can make the transitions a wee bit better. Having video viewing troubles? 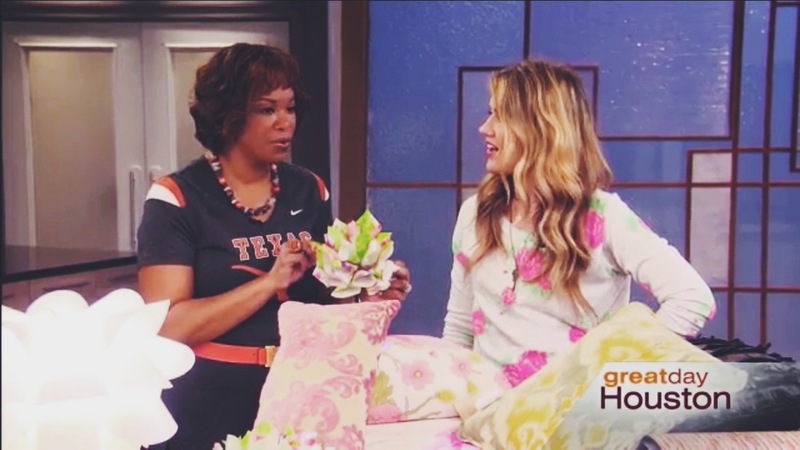 Click link below to watch my Dorm Room Segment on Great Day Houston. its pretty cute not gonna lie. "I LOVE MY DORM ROOM SEGMENT ON GREAT DAY HOUSTON"
I mentor three girls (Carla, Zylah, Aaliyah) that are off in college..oh my word you would just love them; creative, smart, witty and beyond beautiful inside and out. Seriously I am a better human being knowing and loving these girls. They not only teach me but inspire me as well. Speaking of inspire that's just what they did for my latest Great Day Houston segment. How to personalize your dorm room base on their personality and style. girly. florals, monograms, and sparkles are her friend. i cut wrapping paper into small triangles, rolled them up into cones and glued them on to a piece of cardboard. anything quirky or out of the box, mix match bedding with a running theme. I used contact paper used to line drawers as wallpaper and strung pictures across the wall with clips i got at ikea. stripes, chevron patterns, and edge. bold statement pieces are a must! I used my favorite new craft material...wasabi tape. its just like masking tape but it doesn't pull off paint and has a plethora of patterns and colors. Design in small spaces doesn't have to be hard or expensive; all you need is to know your style and be prepared to DIY! Check video for organization tips for makeup and jewelry. mount mirror to back of door, use floating shelves with hook to put makeup brushes on and hang curling iron, blow dryer, ect. and use a storage ottoman for seating. keep it easy, accessible and functional. Take this time to get past all fears and be the person you've always wanted to be. In some way,s it's a fresh new start. Speaking from experience my "shy, couldn't order a meal on her own" sister became a decisive, determined, beautiful young woman when she went off to college by just making the decision to do it. You can do it.